In the wake of his daughter’s tragic death and his subsequent divorce, famous expressionist painter Jim Stegner moves to rural Colorado. He enjoys the solitude, spending his days fly fishing and painting a beautiful young model named Sofia. However, his peaceful life is turned upside down when he witnesses a man beating a little horse. Jim has a history of violence, having spent time in jail for shooting a man in a bar years before, and he must fight to overcome his rage against the man for harming the animal. A few days later, when he encounters the man again, Jim fails to reign in his anger, and he kills the man. It transpires that the man he killed, Dell, was a member of a dangerous gang, and Jim must flee Dell’s friends and the police as he becomes a person of interest in Dell’s death. What follows is a mad dash through the rangeland to Santa Fe, where Jim’s art is sold, and where he has promised to do a commissioned painting. This was an unusual read for me. I tend not to read books that contain violence because shoot ‘em ups just don’t interest me, in books or in film, but I can’t resist books about art and the human psyche. Now, there’s a lot of violence in this book: fighting, shooting, car chases, and murder. But I really liked it because it’s about a lot MORE than just the violence. It’s about a man struggling to overcome his irrational guilt over his daughter’s death. It’s about darkness, grief, love, inspiration, and art. Although I mostly enjoyed this novel overall and thought Heller developed Jim’s character really well, some of the supporting characters fell a bit flat. As Jim’s relationship with Sofia, his model, progresses, I wished her character had been better drawn. (I also had to roll my eyes a little at the artist sleeping with his huge-chested, much younger model.) I just couldn’t see why, apart from being a plot device, their relationship developed the way it did. I thought their relationship could have been written better to feel more true. Overall, I really enjoyed this novel. I loved the way Heller evokes the Colorado landscape and the way this novel played like a movie in my head. It’s a Blockbuster of a book, but you know, with intelligent things to say. 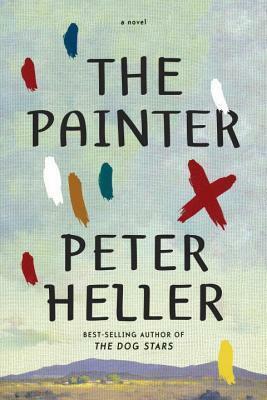 The Painter is a great portrayal of loss, trying to put oneself back together again, and the tension between darkness and art. I really want to read this one as well — sounds so good. Sounds like I would be able to enjoy The Painter… I always like it when the author is able to incorporate other important themes in a novel that otherwise would be only about violence. As a Colorado native, this might jump to the top of my TBR pile. Thanks for the review! This sounds like a great novel. This books has been getting a lot of buzz, but i don’t think it’s going to do it for me. Thanks for the review.